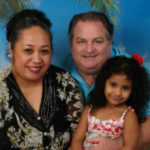 James was called to serve God in Tonga since 1992, and met his wife Mele there. They were married in Tonga in 1995, and continually served in the local Tongan church in various aspects. Tongans are keen about their Family Relations, even to the various extended family members. They typically have large families, and often continue to live with their mother and father even after marriage. Presently James and Mele live in their own house together with Mele’s Parents: Moses, and Nau. They have one adopted daughter, Deanna, aged eight, and Gracie, aged 11 who is under their care for two years now and under consideration for adoption as well.